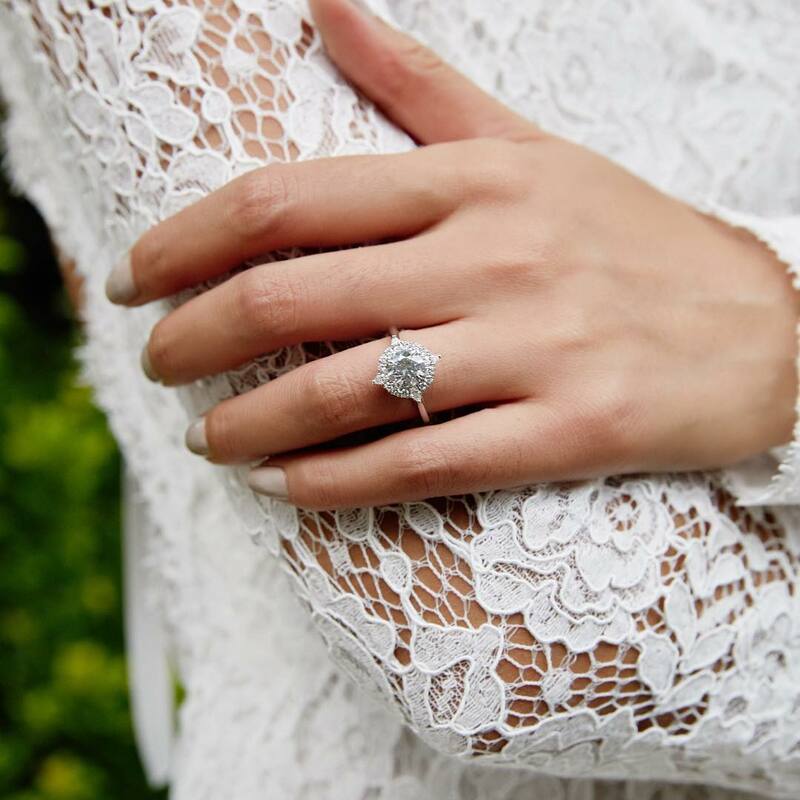 Striking, elegant and timeless, it’s no surprise that halo engagement rings have become one of the most sought after engagement ring styles. 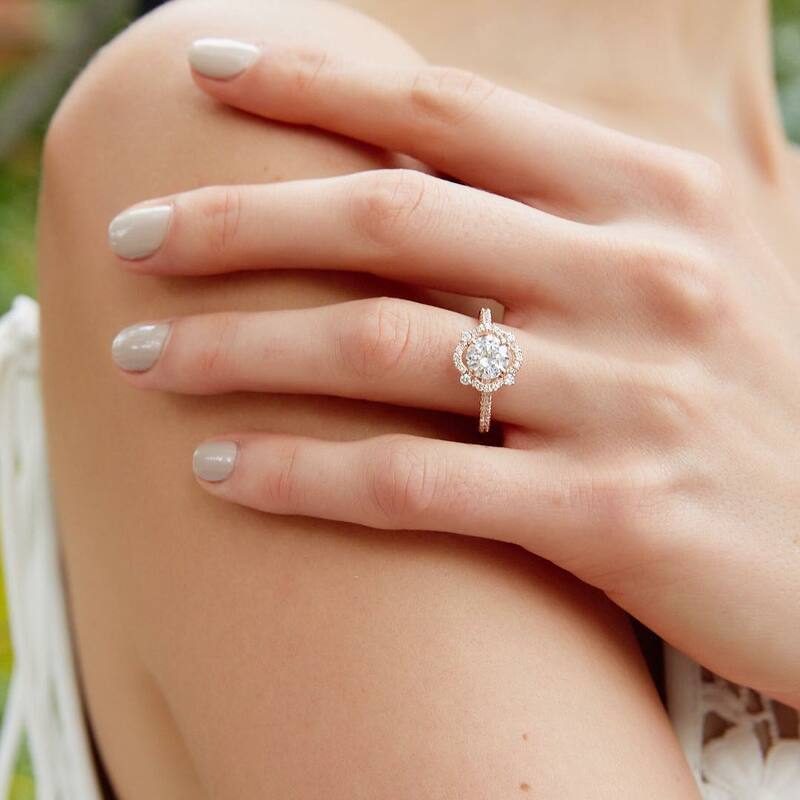 Halo engagement rings complement a wide variety of diamond shapes and design styles, from modern to vintage inspired- allowing you to find a ring that is perfectly suited to your unique style! 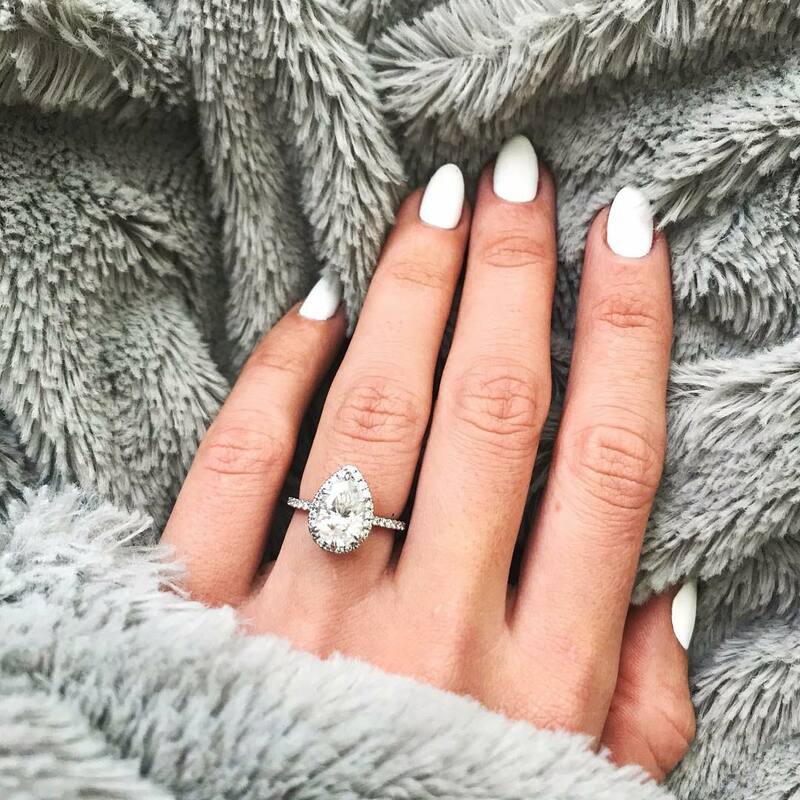 With the growing popularity of halo engagement rings, we looked through our Instagram feed to identify your favorite styles and trends. 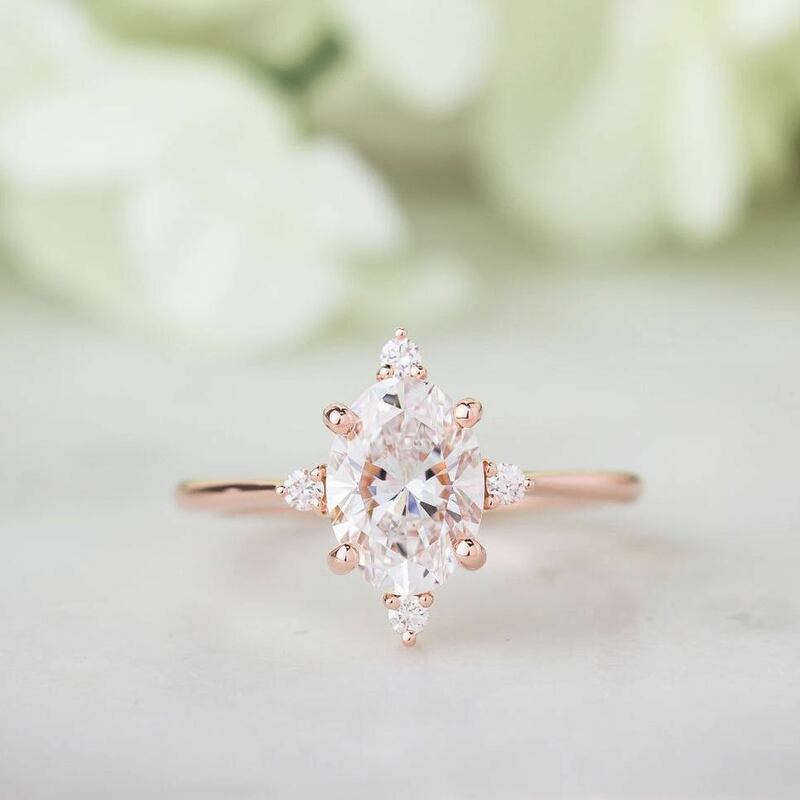 What we’ve found is a love for delicate designs with intricate detailing, and an affinity for rose gold settings and fancy shaped diamonds. See your favorites below! Inspired by the design of a compass, the rose gold Luminesce Diamond Ring exudes elegance in a way that is at once unique and understated. 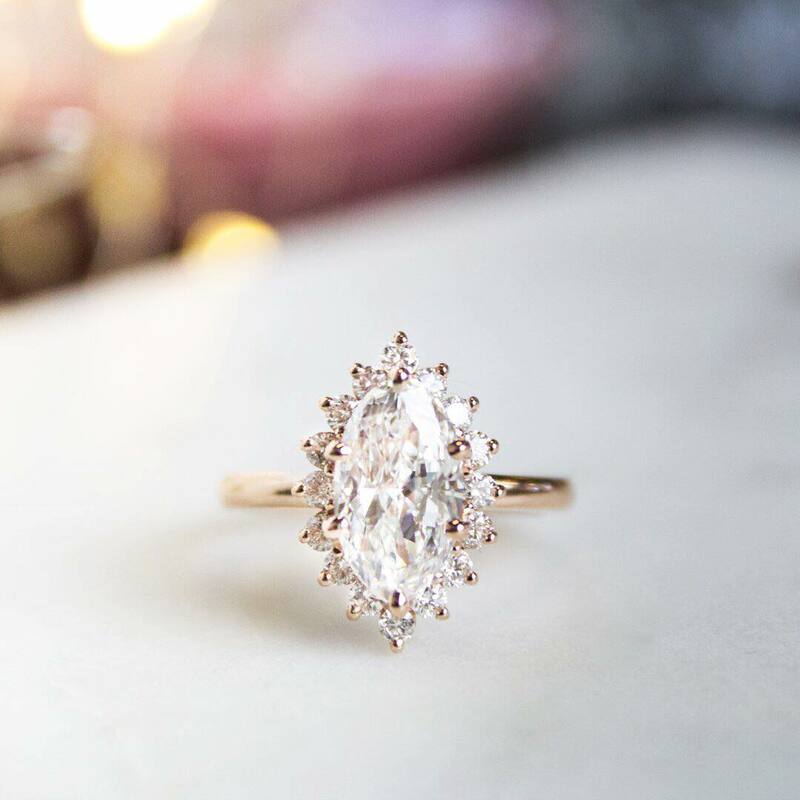 Delicate halo detailing surrounds the center oval diamond for the perfect amount of sparkle! A thin strand of diamonds entwines with a high polished ribbon of white gold in the nature-inspired Petite Twisted Vine Halo Diamond Ring for a captivating look. Adorned with beaded detailing and diamond accents, the Fleur Diamond Ring weaves intricate design elements together to create a uniquely modern and beautifully feminine halo ring. A halo of round and pear-shaped diamonds encircles the sparkling center diamond in the Dahlia Diamond Ring to form an intricate, floral pattern. Delicate beading lines its bridge and inner band, adding to this ring’s evocative and exquisite feel. Luminous, ethereal and exquisite are just some of the adjectives that can be used to describe the rose gold Sol Diamond Ring. 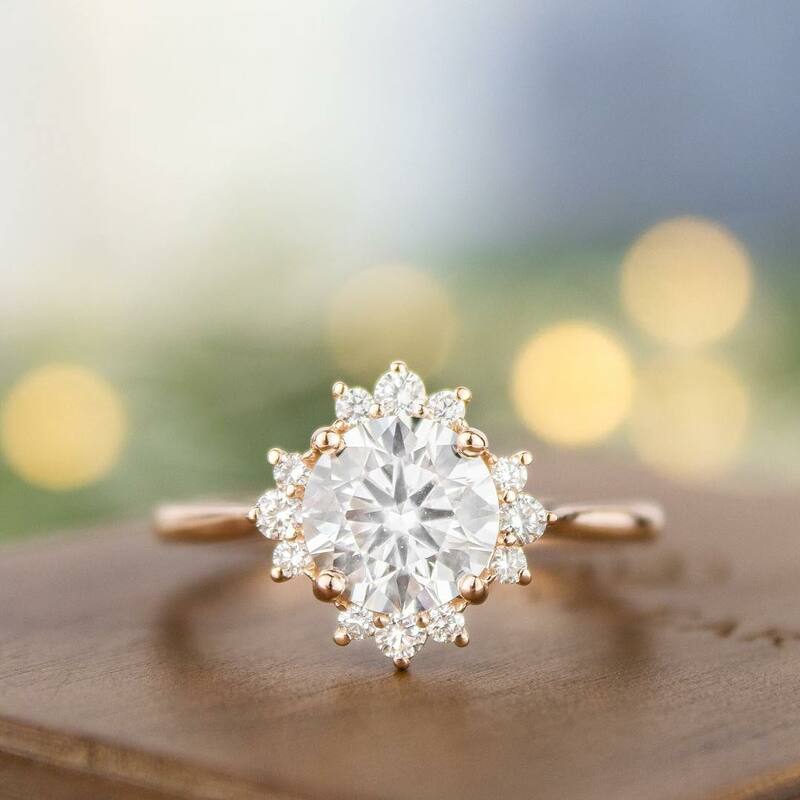 A carefully placed halo of diamonds radiates from the center diamond like the rays of the sun, making this ring shine brilliantly as it catches the light. 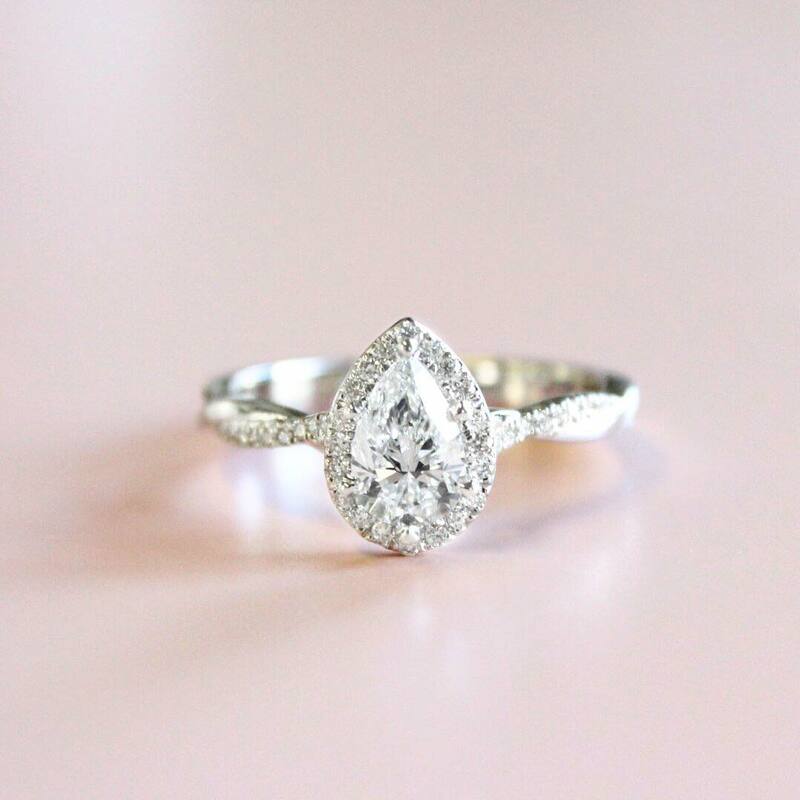 With a glittering array of diamonds delicately surrounding a marquise center diamond, the Sunburst Diamond Ring perfectly balances a romantic, old-world quality with modern touches. 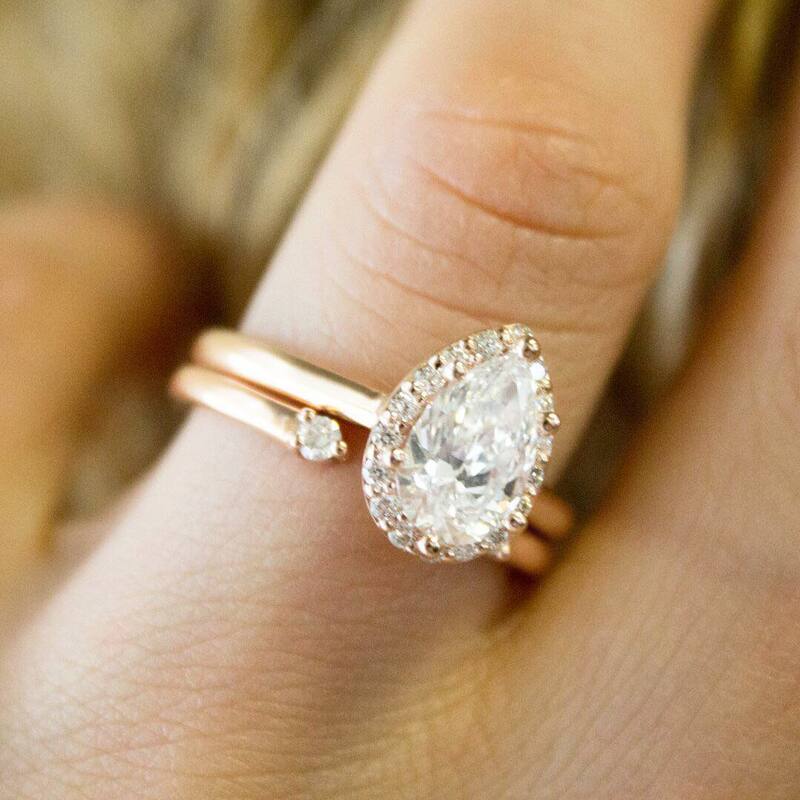 The soft blush tones of its rose gold setting further complement this feminine halo engagement ring. A perfect pear! 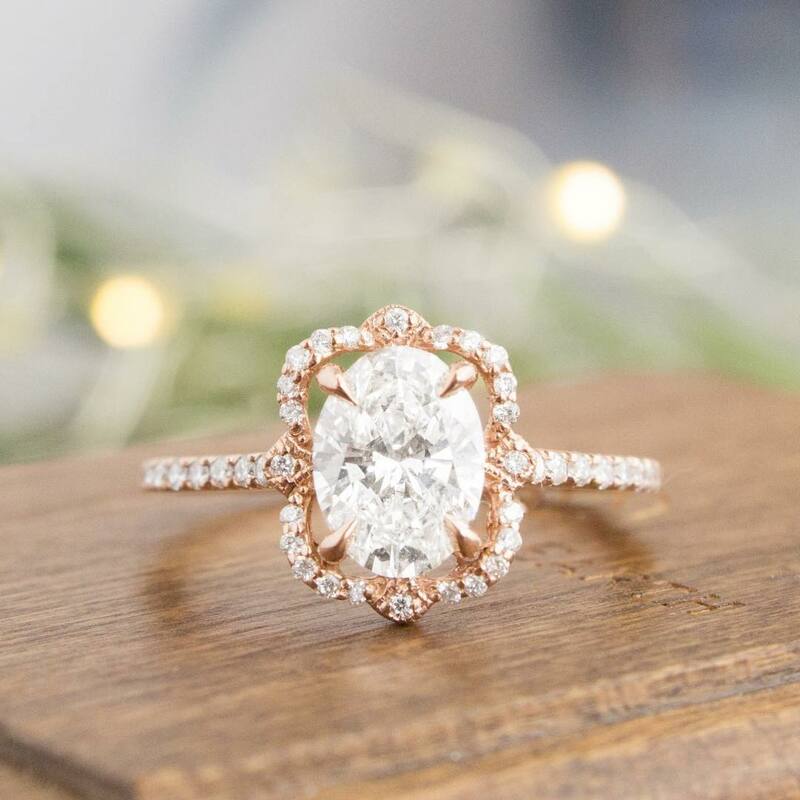 The Fancy Halo Diamond Ring features a classic diamond accented halo that stands out against its lustrous rose gold band. Here, the Fancy Halo Diamond Ring is elegantly paired with the modern and understated Wren Diamond Ring. In the Reina Diamond Ring, an intricate halo surrounds a center oval diamond for a sophisticated and regal silhouette. The scalloped frame of diamond accents and rose gold setting accentuates the exquisite beauty of this halo ring. Both modern and timeless, the Waverly Diamond Ring is one of our most loved engagement ring styles. With its scalloped pavé diamond detailing and gorgeous center pear shaped diamond, it’s easy to see why. Do you agree with our followers? Which of these Halo Engagement Rings is your favorite? Let us know on our Instagram, Facebook, Twitter, or in the comments below!